I hope that you have been keeping up with the Advent stories that I have written weekly. If not, then you can click here to read the other stories: Advent Week 1, Advent Week 2 and Advent Week 3. We have covered the Bible prophecies of Jesus’ birth from the Old Testament, the story of Zacharias and Elizabeth, the shepherds and now it is time to look at the magi or wise men. There is much misconception out there about the magi or wise men. These terms are interchangeable depending on which version of the Bible you use. The King James Version of the Bible calls them wise men whereas the New American Standard Bible refers to them as magi. I hope to show you the real story from Matthew 2. Before we begin, please ask your children/teens the following questions. Don’t tell them the answers, but let them ponder as we go over the stories. You can ask these questions again at the end of the lesson. 2. How many visited Jesus? 3. Did they travel on camels? 4. How long did it take them to arrive in Bethlehem? 5. Did they visit baby Jesus at the stable? 6. Was King Herod aware of the star when he spoke to the Magi? 7. How did the Magi know that the King of the Jews had been born? 8. How many dreams occurred in Matthew 2? This is a very interesting story, which has been misinterpreted countless times throughout the years in Christmas plays and pageants. We have all seen the three kings ride in on camels, in their magnificent clothing, to give the gifts to baby Jesus at the manger, but is this the true story? We can only find the answers by looking at the story in Matthew 2. 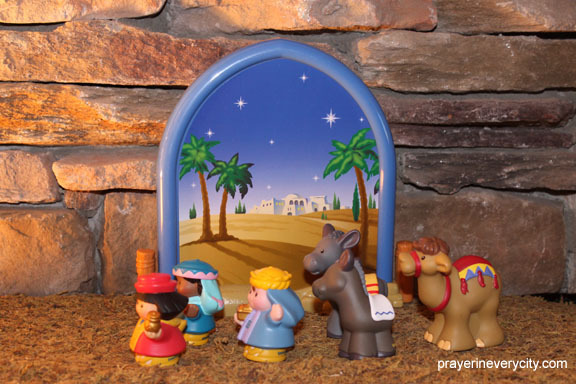 The story opens with the wise men or magi arriving in Jerusalem to speak with King Herod. So who were these men and does the Bible say how many there were? The Bible only tells us they were wise men (plural), but does not say how many. Perhaps people assume there were three because of the three gifts or perhaps they have listened to the song, “We Three Kings”. These men were most likely astronomers or astrologists, but were probably not kings. The Bible says that they came from the east. If you look in verse 16, there is a clue as to how long it took the kings to arrive in Jerusalem after they saw the star. There are some interesting clues about the star in this chapter which often go unnoticed, but if you watch the documentary on YouTube by Frederick A. Larson, “The Star of Bethlehem”, you will learn that these are clues to describe what type of star this must have been. First of all in verse 7, we see that there was an exact time that the star appeared. We can also conclude from this verse that Herod had not noticed the star. Therefore, the shepherds had not seen the star, either. In verse 9, we learn that the star went on before them until it came and stood over the place where the Child was. I highly recommend you watch the above documentary, because you will be amazed at how God had a story written in the stars before time began. The movement of the stars operates like a clock and there is a certain mathematical formula to determine the position of the stars on any given day in the past, present or future. God wrote a story in the stars about Christ’s birth as well as His death and it was written when He created the world. At creation, God knew exactly the timing that Christ would be born and when He would die. You will be more in awe of the Lord after watching this documentary. Look at verses 9-11 to see the location the Magi found Baby Jesus. In actuality, Jesus was a toddler at this time probably around the age of two. The star rested above the house (not the stable) where Jesus lived at this time. Another interesting part of this story is the amount of dreams which take place. The angel appeared to both Mary and Zacharias, but only spoke to the magi and Joseph in dreams. I don’t know why this was the case, but it is interesting to me. Joseph had three dreams in this chapter and the Magi had one. It is also interesting to me that the angel only spoke to Mary one time, but then God communicated through dreams to Joseph after this. We never know the answers to these types of observations, but I still like to bring attention to the details. As a result of the three dreams of Joseph, they move to Egypt, then back to Israel to a region called Galilee. They settled in a city called Nazareth. All of this fulfilled Bible prophecy from the Old Testament. If you recall from my first lesson, the audience for the book of Matthew is the Jews. Therefore, Old Testament prophecy would have been very important to them. There are references to 4 different Bible prophecies being fulfilled in this single chapter. Can you figure out which verses they are? If you look at the questions I asked at the beginning, we have not discussed the mode of transportation for the Magi. Does the Bible mention how they rode or walked to Jerusalem? The only other question we have not answered is number 7. According to Mr. Larson some scholars believe the magi came from Babylon because there was a certain school of magi who studied the stars in this region. If you recall, the Jews had been in exile in Babylon for 70 years. This is where we get the stories of Daniel and the Lion’s Den and the Fiery Furnace. Even though the Jews eventually were able to return to Israel, not all of the Jews left Babylon. Perhaps these magi were of Jewish descent and were looking for signs in the stars for the Messiah. I hope as we have studied the Christmas story these past few weeks, you have realized the importance of studying the Bible for yourselves. When we listen to a story or see a play, we may miss out on the details of the Bible or we can even hear details which have been added to the Bible. Please learn how to study the Bible. Precept Ministries is a good place to start by learning the Inductive Bible Study method. Kay Arthur has written books especially for children and teens. I highly recommend the purchase of the documentary, “The Star of Bethlehem”, after viewing the 10 minute segments on YouTube. I believe there are 8 or 9 segments to watch. You can purchase from Amazon or directly from Mr. Larson’s website: http://www.bethlehemstar.net/. Larson, Frederick A., writer. The Star of Bethlehem. Dir., Stephen Vidano, Prod., Stephen McEveety, Stephen Vidano Films, Mpower Pictures Home Video, 2009.